In the early 1970�s when Lost in Space was still doing well across the country in afternoon television syndication a primitive fan base was beginning to develop. Irwin�s fantastic television series may have been filled with computers but in those days American homes were not. (Expensive) long-distance calls and the US Mail were the only way fans could communicate-until a letter appeared in the fan mail section of Forry Ackerman�s Famous Monsters of Filmland number 87 in 1971. Written by Irwin Allen fan Ron Sapp the letter expressed Ron�s ambition to unite fans of the four classic television series-Lost in Space, Voyage to the Bottom of the Sea, Time Tunnel and Land of the Giants-through a newsletter/fanzine he planned to publish and the letter included his mailing address. Fans like myself responded and were treated to what was, as far as I can ascertain, the first Irwin Allen fanzine ever published, Television Science-Fantasy. 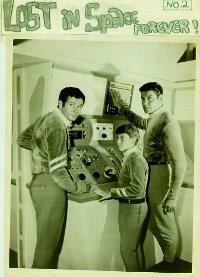 Included in issue one was an interview with Ezra Stone, director of many Lost in Space episodes. 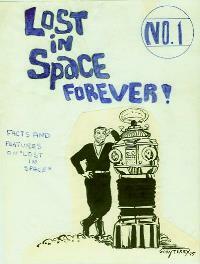 Ron�s efforts inspired another fan, Bob Richards, to create The Lost in Space Review, acknowledged as the very first all-Lost in Space Fanzine ever published. Three issues and a one-page newsletter were released courtesy of Bob�s local library Xerox machine with questionable results-the photos were awful but the articles were interesting. Each issue was about 5 pages of photos, reprinted articles and even the first LIS fanfic-the beginning of a season one original story. And it is here the infamous �Secret of the Jupiter 2� rumor first found its way into print . Supposedly (but since of course proven untrue) there was a fourth season LIS opener filmed but never shown with this title that featured Gary (Land of the Giants) Conway as Koneg , an alien who stowed away in Dr. Smith�s cabin and planned to hijack the Jupiter for a trip back to his home planet Koron. Granted, it would have made one heck of an episode but none of it was true. Bob�s endeavours in turn inspired another would-be publishing mogul to create an improved (so he thought) Lost in Space fanzine-yours truly, Bruce Fedow. 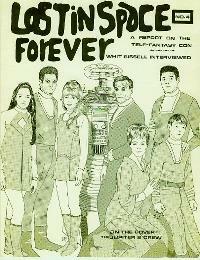 Titled Lost in Space Forever I kept this cash vacuum going for 9 issues for about fifty subscribers from the U.S. and Can ada. For their 3 bucks members of my Lost in Space fanclub received a membership card several issues of the fanzine and an 8x10 of Smith and the robot. 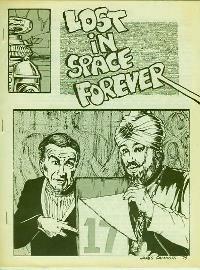 Ron Sapp and I corresponded regularly and he always ended his letters with �Lost in Space Forever!� When I launched my fanzine I asked his permission to use that for the title and got it. Garry Terry, a very talented artist, created the cover for the first issue and was slated to do a comic book version of �The Reluctant Stowaway� episode that never came to pass. 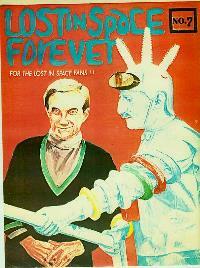 Later covers included photos and original cover art by talented artists like Mark Fedow and Stan Day. Inside were reprinted 1960�s and 1970�s articles from small local newspapers that, if not for the urge to contribute by the LISF subscribers who mailed in articles like this by the dozens would not have been seen by anyone else, as well as rare photos, original fan art (again submitted by subscribers en masse), works of fiction, and by issue 8 my first interview with a genuine LIS cast member (I had interviewed Whit Bissell of Time Tunnel fame in an earlier issue)-Jonathan Harris, who corresponded with me regularly in the 70�s and agreed to a mail-in interview via typewritten letters which I cherish to this day. After nine issues I turned the reins over to David Krinsky , who kept it going for a few more issues featuring incredible fan-drawn covers and amazing interviews with stars, guest stars. writers and directors. David handed the publishing chores over to Joel Eisner, who soon retitled the magazine �The Irwin Allen Big 4 Fan Journal� where it featured all four of Irwin Allen�s 60�s sci fi shows and this continued for a few more years, loaded with even more interviews . Many ofthose talented individuals who contributed have long since passed away and these magazines are the only link to their comments on the series. Talented actors like Fritz Feld, Michael Conrad, and Alan Hewitt added their impressions of life on Lost in Space (not all of them favorable! ), and the infamous director Don Richardson interview probably ticked off a lot of people directly connected to the show-this after it was edited for fear of slander lawsuits by those mentioned!